Leanne Cope and Robert Fairchild. Photo Courtesy Trafalger Releasing. An American in Paris, the wildly popular musical directed and choreographed by Christopher Wheeldon, comes to movie theaters nationwide September 20 and 23. Filmed in London in 2017, this version features the show's original stars: former New York City Ballet principal Robert Fairchild and former Royal Ballet first artist Leanne Cope. Based on the classic 1951 Gene Kelly film with a score of Gershwin standards, An American in Paris played on Broadway and in London's West End to rave reviews and numerous awards, including a 2015 Tony for Best Choreographer. This limited screening will bring the best of Broadway up close to the masses. For a full list of participating theaters and to purchase tickets, available July 12, click here. Fairchild and Sterling Hilton in "Duo Concertant." Photo by Paul Kolnik, Courtesy NYCB. 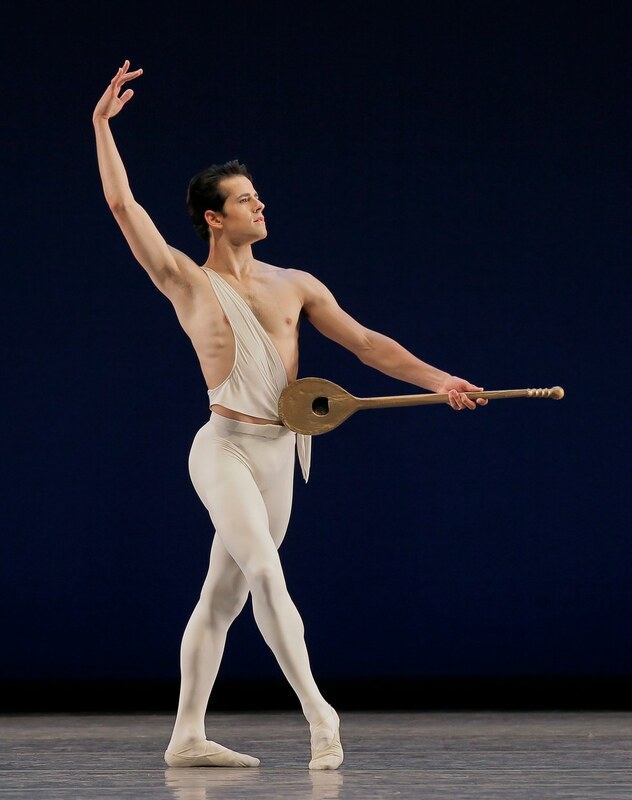 New York City Ballet announced today that principal dancer Robert Fairchild will give his final performances with the company this October. Since his 2015 leave of absence to make his Broadway debut as Jerry Mulligan in Christopher Wheeldon's An American in Paris, Fairchild's presence on the Koch Theater stage has been rare. A true song-and-dance man, as a child he dreamt of following in the footsteps (or tap shoes) of Gene Kelly. Fairchild leaves the world of ballet to take on the surplus of opportunities in musical theater that have recently come his way. Fairchild in "Apollo." Photo by Paul Kolnik, Courtesy NYCB. Robert Fairchild and Leanne Cope in An American in Paris. Photo Courtesy Broadway World. If you haven't seen Christopher Wheeldon's Tony Award winning musical An American in Paris yet, you better hop to it. The hugely successful Broadway production closes on January 1, 2017 after a nearly two-year long run. Don't panic if you can't drop everything and buy a plane ticket to New York, though: The show will commence its national tour in October 2016. The U.S. tour will star former San Francisco Ballet soloist Garen Scribner as Jerry Mulligan (who has been performing the role on Broadway) and former Miami City Ballet soloist Sara Esty as Lise Dassin. At the show's London opening in March 2017, New York City Ballet principal Robert Fairchild and The Royal Ballet's Leanne Cope will reprise their originating roles. Violinist Karl Nikkanen with Daniel Ulbricht in Johan Kobborg's Les Lutin. Photo by Christopher Duggan, Courtesy DAC. Six years ago, New York City Ballet principal Daniel Ulbricht and Erin Fogarty, director of programming at Manhattan Youth Ballet, teamed up to create Dance Against Cancer. The annual benefit for the American Cancer Society brings together ballet, modern and Broadway dancers, with every performer donating their own time. Pointe spoke with Ulbricht before this year's event, Apr. 25 at the AXA Equitable Theater in New York City. How do the dancers get involved? This year we have 18 pieces--5 are premieres--and there are still dancers who want to perform. As their own family or friends or mentors suffer, I think they feel compelled to ask, "What can I do?" And we have many artists, like Tiler Peck, Robbie Fairchild, Craig Hall and Gillian Murphy, who have been so gracious to work with us year after year. In one night, you can see dancers from companies like Ailey, Parsons Dance, Noche Flamenca, ABT and City Ballet. It's incredible. "An American in Paris" to Appear on "The Late Show with Stephen Colbert"
As America anxiously awaits Stephen Colbert's return to the small screen, dance and theater fans have something special to look forward to. Christopher Wheeldon, the choreographer of Broadway's An American in Paris, along with its two stars, New York City Ballet principal Robert Fairchild and Royal Ballet first artist Leanne Cope, will appear on "The Late Show" on September 18. Fairchild and Cope will perform an excerpt from American in Paris. Kudos to Colbert for featuring performers beyond the usual Hollywood stars! Walking to work in the morning with Peck's maltipoo, Cali, and Fairchild's toy Australian shepherd, Griz. Kyle Froman. Growing up together, first as students at the School of American Ballet and then as young dancers on the rise at New York City Ballet, Tiler Peck and Robert Fairchild dated off and on. With their lives on the same track for nearly a decade, it's no wonder they felt a special bond. Their relationship became serious several years ago. “I feel so lucky to have Tiler in the same industry," says Fairchild. “We understand the struggles and the achievements that come along with this career, and it's so meaningful to share those moments with someone who truly gets it." The couple, who live in a one-bedroom apartment five blocks from the theater, married in June at the end of NYCB's spring season. A few weeks before, Pointe followed them through a typical day. Tiler Peck photographed by Nathan Sayers for Pointe. 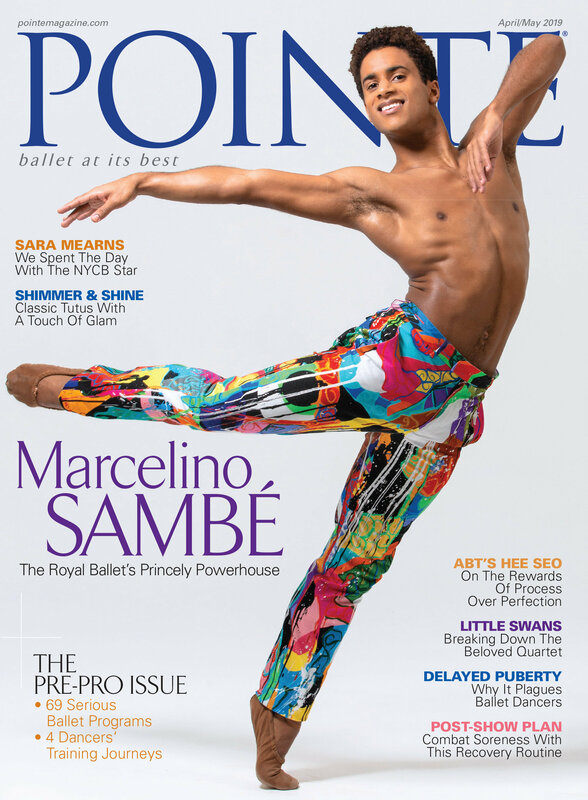 This is Pointe's August/September 2014 Cover Story. You can subscribe to the magazine here. A few months ago, Tiler Peck turned 25. It's an age when most ballet dancers are earning their first breakout roles, gradually discovering who they are onstage. Not Peck. She followed an uncommonly accelerated path to the spotlight, joining New York City Ballet as an apprentice in 2004 at age 15 and becoming a principal in 2009. An enormously versatile dancer with prodigious technical gifts, she already has an enviable ballet resumé. She knows exactly who she is on NYCB's stage. Yet Peck has an appetite for challenges that has led her outside the ballet world. Her growing list of musical theater credits isn't a surprise to longtime fans: Peck started out in jazz and commercial work, earning a role in director/choreographer Susan Stroman's production of The Music Man on Broadway when she was just 11. She and her husband, fellow NYCB principal Robert Fairchild, had a well-received turn in the New York Philharmonic's production of Rodgers and Hammerstein's Carousel last year, which was later broadcast on PBS. In October, Peck will take on her biggest theatrical challenge to date: She's set to dance (and sing and act) the title role in the new musical Little Dancer at the Kennedy Center. The project reunites her with Stroman, who custom-tailored Little Dancer—the story of the student who inspired Edgar Degas' iconic sculpture—to Peck. “I was envisioning Tiler even as we were writing it," Stroman says. “From the earliest stages, it was always her in my mind." Sterling Hyltin photographed for Pointe by Nathan Sayers. Daylight saving time had been in effect only a few hours last November when New York City Ballet principal Sterling Hyltin entered an NYCB rehearsal studio to recapture history. In Classroom 2 on the seventh floor, the clock had been turned back to 1968, when NYCB premiered Balanchine's La Source, a demanding pas de deux with four solos set to a Léo Delibes score and made on Violette Verdy and John Prinz. The George Balanchine Foundation, which is dedicated to preserving the choreographer's ballets in a state as close to the original as possible, had arranged to tape Hyltin and Gonzalo Garcia in practice clothes performing La Source. Verdy herself was there as an expert observer and advisor, while Helgi Tomasson, who often performed La Source at New York City Ballet before becoming artistic director of San Francisco Ballet, served as co-critic. Lined up along one mirrored wall of the classroom were an accompanist at a grand piano, a movie cameraman, sound technicians and an assistant responsible for keeping a boom mike hovering out of camera range to catch every word Verdy and Tomasson said to Hyltin and Garcia. Choosing Hyltin for taping this demanding role would have surprised no one who saw her debut in La Source the last week of the 2010 spring season. She had only one opportunity to achieve its many piquant subtleties, such as the brace of gargouillades that blossom amid a flourish of footwork, and she performed each with the assurance and precision of a veteran. “NYCB ballet master Sally Leland invited me to observe the company rehearse the three casts," Verdy recalls. “Sterling was incredible, with endless arms and legs, and she was always open to criticism. Her dancing has a quality I call 'true from the inside.' "
If you’ve only seen Robert Fairchild displaying his elegant line in Peter Martins’ Romeo + Juliet, you might never guess that he started out as a tap and jazz baby. But watch the New York City Ballet soloist tear through a wickedly off-balance solo in Jorma Elo’s Slice to Sharp and you’ll see his jazz training shine through. As dancers, we thrive on that ability to transcend the normal and become someone (or something) else on stage. It places us among the lucky few people who have the opportunity to experience that intangible freedom of another world. But aside from those precious moments in performance, we spend hours and hours in the normal classroom grind, preparing ourselves for rehearsal, where we’ll spend hours and hours preparing for the product—our performance. The overwhelming majority of our time as ballet dancers is spent either preparing or preparing to prepare for time on stage, and naturally, we strive to make the most of it. But all too often, I find myself working so hard on technical improvements in class that I forget to perform, to live the motivation of my movement—which is, after all, one of the greatest gifts of dance and the reason I’m there in the first place. A couple days ago, I had the opportunity of taking a master class with Robert Fairchild, principal with New York City Ballet. I have to admit, I was pretty nervous. But as he began class, I was surprised by how relaxed, how stress-free (yet exacting) the atmosphere was. He spoke to us as fellow students and artists, sharing his recent technical revelations (an image of lightning striking through the supporting leg in frappe) and his least favorite steps (his body isn’t a huge fan of arabesque). He gave us a lot of individual attention and technical corrections, but most of all, he urged us to express through our eyes, to reveal the essence of who we are as individuals. No vacant expressions or tense concentrating faces were allowed. If he asked someone to show him a step again to improve the footwork, it wasn’t good enough until it was demonstrated with full artistic commitment and correct head placement. The class became so much more than a technical struggle; it was, rather, an artistic experience. Gaining the confidence to go beyond steps to express through movement the essence of my individual humanity was something that I struggled with as a young dancer. It takes a lot of courage to do this, to really dance and become that vulnerable. But that human connection is the reason why people come to see live dance—otherwise, all we’d need were computer-generated dancers on screen who could perform infinite pirouettes and balances without the struggles (and extraordinary accomplishments) of basic humanity. It's so much more than just putting on a "performance face" while on stage. It makes dance an expression of the heart and makes connection with the audience a transcendent experience. My turning point came when I realized that even though my turnout isn’t 180 degrees, I’m human, and that gives me something worthwhile to express. We are all valuable with something unique to share, and whether we are short or tall, flexible or muscular, thin or not, dance gives us the opportunity to say it through movement. Of course, we absorb and work within the aspects of the choreography we are given, but the spirit in our eyes and a deep understanding of what we are dancing are what take us from the level of technician to artist. Even if we spend very little time performing on stage, class is the perfect opportunity to do just that. Now Ulbricht can add humanitarian to his already impressive resume: He and Erin Fogarty are producing "Dance Against Cancer," a benefit for The American Cancer Society, which will take place at Manhattan Movement and Arts Center this Monday, April 25. And you'd be hard-pressed to dream up a better program. Wendy Whelan and Craig Hall performing the gorgeous pas de deux from Christopher Wheeldon's "After the Rain"? Check. A ballet by golden-boy choreographer Benjamin Millepied? Check. Crazy-awesome contemporary troupe Keigwin + Company? Check. "So You Think You Can Dance" phenomenon Alex Wong? Check. A slew of other NYCB principals, including Janie Taylor, Tyler Angle, Robert Fairchild, Sterling Hyltin, Amar Ramasar, Maria Kowroski and, yes, Ulbricht himself? Check, check, check. For tickets and more information, click here. Then visit cancer.org to learn about the invaluable work done by The American Cancer Society. Although the New York Philharmonic's upcoming production of Carousel focuses on Rodgers & Hammerstein's iconic music, the show will also feature one exceptional moment of dance: It's just been announced that New York City Ballet principals Tiler Peck and Robert Fairchild will guest star in a pas de deux in Act II. Peck will dance the role of Louise and Fairchild will portray the Carnival Boy, dancing choreography by Warren Carlyle. The show, performed in New York February 27–March 2, will be telecast nationally on PBS through "Live From Lincoln Center" on April 26. Find out more at nyphil.org.